I have just received this as a wedding gift.I have never seen this one before. I haven't tried the 16yr yet. I took your advise and called many of my local stores to see if one had been hidden away no luck. Everything I have read about the 15 makes me want it more and more.I Live in Maryland no shipping....At least the 16yr looks nice sitting on the shelf! 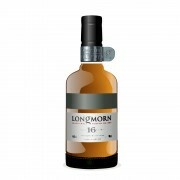 I sighted a Longmorn 15 in a mom-pop liquor store today for $55(after tax), should I run to buy this? Yes. They don't make it anymore.